HomeGroup SessionMy Next Group Session Night is April 8th for Pateron Members! 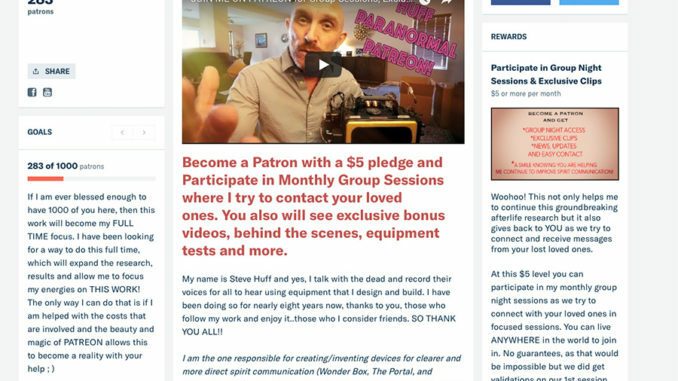 March 29, 2018 Group Session, Patreon Comments Off on My Next Group Session Night is April 8th for Pateron Members! Hey all, just a note to say that my next group night session, where we try to reach your loved ones in a spirit session with my Wonder Box Gold, DR60 and even using Water ITC for photos will be on April 8th. If you are not yet a Patron on my Patreon, you should check it out (see it HERE). For $5 you get access to participate in the monthly group session, bonus clips and behind the scenes clips, one exclusive Patron Only video per month and you can contact me at any time with questions with a guaranteed reply. ; ) To see details, head over to my Patreon page HERE and watch the video, read the description and if you want to join in, you can do so. All Patrons can participate in the next group session on April 8th and all details are posted there for Patrons.